On Feb. 5, a Hong Kong-based bulk carrier, the MV Solomon Trader, ran aground off a remote island in the Solomon Islands. It spilled heavy fuel across coastal waters, beaches and a sensitive coral reef system not far from a UNESCO World Heritage Site. 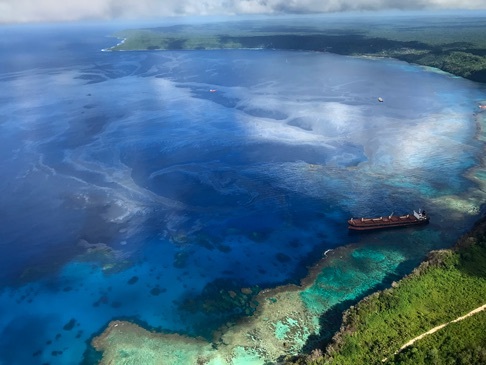 On March 18, the Solomon Islands National Disaster Management Office reported that salvage experts have finally stabilized the beleaguered ship and stopped the fuel leak. An estimated 80 metric tons (88 tons) of heavy fuel oil escaped from the ship, but the government maintains that the full environmental impact of the spill remains to be determined. The Solomon Islands government, aided by Australia, began a cleanup operation in early March that continues. An international effort to halt a massive oil spill from a wrecked ship in a far-flung province of the Solomon Islands in the southwest Pacific has finally succeeded. But the scale of damage to the marine and coastal environment near Rennell Island, where the incident occurred within a few kilometers of a UNESCO World Heritage Site, is still being reckoned. On Feb. 5, the Hong Kong-based MV Solomon Trader ran aground in bad weather, spilling heavy fuel across coastal waters, beaches and a sensitive coral reef system. Local experts decried the spill as potentially the country’s worst human-made environmental disaster. “The full extent of the impact of the oil spill on the ocean and environment is yet to be determined. The investigation is ongoing and may take some time,” Joe Horokou, director of environment and conservation at the Solomon Islands environment ministry, told Mongabay. However, the Australian Department of Foreign Affairs and Trade, which sent a team of marine and environmental experts to support the Solomon Islands’ disaster response, offered a bit more detail. “More than 80 tonnes [88 tons] of heavy fuel oil has dispersed across the island’s sea and shoreline, contaminating the ecologically delicate area,” the agency stated in a March 25 press release. A large oil slick emanates from the MV Solomon Trader after it ran aground near Rennell Island on Feb. 5. The oil has contaminated the ecologically delicate area in the Solomon Islands. Image courtesy of Australian Department of Foreign Affairs & Trade. The Solomon Islands is part of the marine biodiversity-rich Coral Triangle and has one of the world’s most important coral reef systems, home to 485 coral species and 1,019 fish species. The MV Solomon Trader was loading bauxite in Kangava Bay from a mine located on western Rennell Island for export to China when violent weather generated by Cyclone Oma drove it onto a nearby reef. The vessel’s grounding caused extensive damage to its hull and fuel tanks, which were carrying some 700 metric tons (772 tons) of oil. Rennell Island, one of the country’s outlying islands in its southern Rennell and Bellona Province, is geographically remote with little infrastructure and few services. The shipowner, Hong Kong-based King Trader Ltd., failed to respond quickly to the spill, and fuel continued to leak from the wreck for more than a month. King Trader claims that weather conditions remained too dangerous for salvage operations to start. On Feb. 16, the Solomon Islands requested help from the Australian government. By early March, the oil slick extended more than 6 kilometers (3.7 miles) along the island’s shoreline, according to news reports. A two-week pollution control operation by a Solomon Islands and Australian team began March 7. Eleven days later, the Solomon Islands National Disaster Management Office (NDMO) reported that salvage experts had stabilized the beleaguered ship and stopped the fuel leak. As of last week, booms were limiting the spread of oil into the deeper ocean, and a cleanup of the beaches and coastline was underway in partnership with local communities. But the toll of the incident on the marine environment and human health is only just beginning to be tallied. Scientists report that oil spills can kill fish and invertebrates directly, while toxic compounds can curtail coral growth and reproduction and diminish coral and fish biodiversity. There is no doubting the environmental sensitivity of the site of the shipping disaster. The southern third of Rennell Island, not far from Kangava Bay, comprising 370 square kilometers (143 square miles) of forest and a marine area extending 5.5 kilometers (3.4 miles) out to sea, was declared a UNESCO World Heritage Site in 1998. Then, six years ago, the site, which provides habitat for 10 endemic plant species, 43 species of breeding land and water birds, and 730 species of insects, was red-flagged on the World Heritage in Danger List. UNESCO identified a number of threats to its status from logging activities on the western half of the island and invasive species introduced by logging and container ships, as well as climate change and the overexploitation of marine resources. “The World Heritage Site is not affected by the spillage as the oil was mainly found in particular locations within the bay,” Horokou told Mongabay. Nevertheless, the Solomon Islands government has asked the United Nations to provide more independent environmental testing. 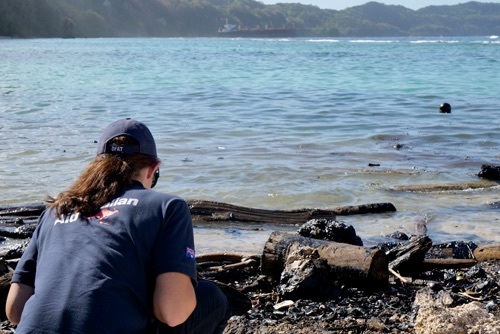 An Australian Embassy official surveys oil spill damage to the shoreline of Rennell Island. Image courtesy of Australian Department of Foreign Affairs & Trade. In the meantime, the spill has affected local communities’ food and water security. With almost no rainfall during the past month, people living in coastal villages near the spill are facing water shortages that could lead to a potential increase in cases of diarrhea, according to the NDMO. Authorities have also warned them to stop eating locally caught fish and shellfish, critical components of their food supply. Solomon Islands authorities say that the shipowner and its insurer are responsible for addressing the environmental damage, although the environment ministry has stated that further actions to hold specific entities accountable, and potentially seek compensation, will not occur until government investigations into the incident and the scale of damage are completed. “My government is prepared to go as far as putting the companies on a blacklist internationally if they do not take on their responsibilities,” Solomon Islands Prime Minister Rick Houenipwela declared at a press conference March 7. 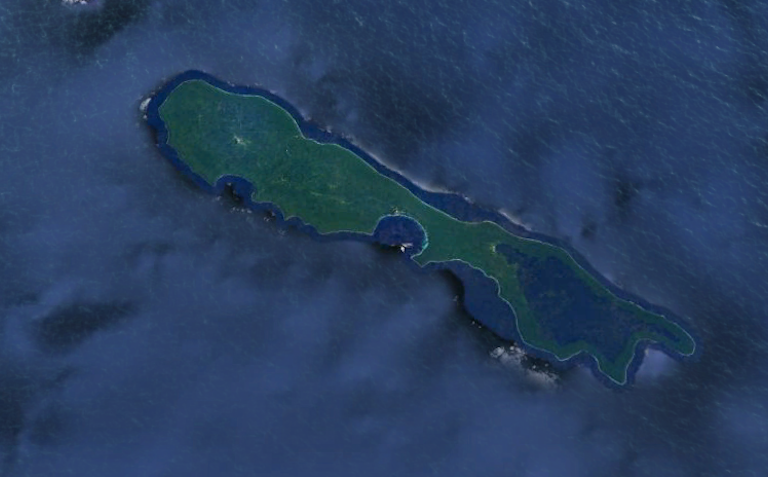 A satellite image of Rennell Island in the Solomon Islands, where the oil spill occurred. Image courtesy of Google Earth. The Solomon Islands is still recovering and rebuilding following a devastating five-year civil conflict that started in the late 1990s. The country’s limited capacity and resources hamper its ability to respond fully to disasters, and it doesn’t have sufficient legal protection and legislative powers to follow through in holding international entities accountable for loss and damage. The country is a vast archipelago of more than 900 islands spread over 854,000 square kilometers (330,000 square miles) with high exposure to earthquakes, cyclones and tsunamis. Government functions, such as coordinating a national response to disasters or overseeing the shipping industry and high-risk extractive activities like logging and mining, are hampered by limited transportation, unreliable communications and the absence of roads and infrastructure in many parts of the country. Inadequate laws also leave the country vulnerable. Prime Minister Houenipwelahas already called for a review and reform of the country’s environmental and mining regulations, which do not provide for enforcing responsibility and securing compensation from companies involved in environmental destruction. However, the country took a step in passing the Solomon Islands Maritime Authority Bill in August last year. The new legislation paves the way for setting up a regulatory organization mandated to develop nationwide shipping services and ensure compliance with international maritime laws. Currently, the Solomon Islands is not a signatory of key agreements, such as the International Convention for the Prevention of Pollution from Ships. The Indonesian mining company contracted to extract bauxite on Rennell Island that chartered the Solomon Trader, Bintan Mining Solomon Islands Ltd., has made no public statements in the wake of the spill. But mining ventures have a troubled history inRennell and Bellona Province. Allegations of impropriety and irregularities in the awarding of a mining license to another Indonesian company active on the island, PT Mega Bintang Borneo Ltd., led to its license being revoked in 2014. Extractive industries, and logging in particular, have been the focus of accusations of high-level corruption and environmental destruction in the Solomon Islands in recent decades. Political patronage of foreign companies, extensive kickbacks and the loss of revenue to hefty tax exemptions are well documented. But unlike its experience in logging, the country has few operating mines and limited experience in managing them. In 2012, the Solomon Islands became a candidate for implementing the rigorous Extractive Industries Transparency Initiative Standard, but withdrew in June last year. The initiative reports that the country needs to significantly boost its legal and regulatory framework and ability to control mining production, exports and revenues to restart the process. Meanwhile, local communities on Rennell Island remain in limbo. 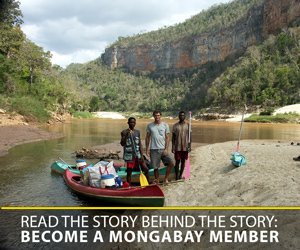 Unable to fish with their beaches polluted, they’re waiting to find out how serious the devastation is and what hope remains for environmental recovery.